With the autumn leaves falling all around us in the backyard, it’s handy to know the best way to keep your trampoline clean. Safe to say, it’s really easy and can be a good excuse to get wet and have fun in the backyard! 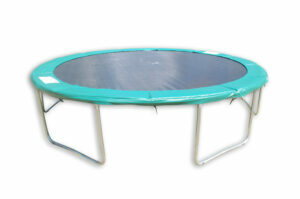 Clean the trampoline only with cold water (never use detergents, soaps or other solvents to clean the mat surface because this will impact on the durability and life of your mat).